The Samsung Galaxy S7 has leaked profusely in the past few days, both in pretty legit press renders and real-life snaps. Our rumor review is chock full of these, but don't feel like we are complaining. Not at all! We are pretty happy to get hold of any leaks regarding the upcoming Samsung flagship or its larger "edge" sibling. Now, with merely days to the S7's debut, it's more than normal for more leaks than usual to be hitting us from all directions. Just yesterday, we showed you one of the more curious and brazen leaks of recent - a Galaxy S7 edge prototype listed up for sale on Dubai's equivalent of Craigslist. Today's a new day, and we have got yet another saucy leak. This time around, it's the Galaxy S7 that is making the rounds. An operational S7 is snapped in a couple of pictures and a brief video obtained by Android Authority, which confirm a couple of important tidbits of info. Feb 16, 2016, 3:39 AM, by Daniel P.
First of all, it's now certain a microSD card slot will be making the cut next to the SIM slot. Additionally, it seems that there is no USB Type-C in sight. Thirdly, though not confirmed, Android Authority says there won't be a 3,000mAh battery, but "merely" a 2,800mAh one in the Galaxy S7. We are still hoping for the larger juicer, though. Last, but not least, we get to see the interface of the phone for the first time, with what seems to be only minor touchups to the iconography and the interface design of TouchWiz. Oh, and Flipboard is still going strong! By the way, if you are concerned about the fingerprint smudges on the back, take a closer look at the back: there seems to be some kind of thin plastic film, its cutouts are visible near the camera and the flash. Hopefully, the real deal won't be such a grease magnet. Any opinions? The design is not bad , but i like it less than S6. What??? It is basically identical to the S6 design! Yes, basically S6 which is basically a S5 design which is indeed basically a S4 design and needless to say it is also basically a S3 design, the basic design Samsung started back in 2012. S6 is an Unattractive looking device but it's better looking than S3, S5 but worse looking than S4, S6. S4 design with S6 materials or full metal would be a stunner. this leaked S7 designs aren't as good as S6 in my opinion. fingerprints are way more visible than S6. This is your opinion. I am writing about fingerprints. RTFA. It has a protective film. You have no idea how the actual phone looks. You can't check something that's empty. You have to be a blind iPhone fanboy to try to claim the S6 looks in any way like the S5. +1 from me. Agree, the only nice phone was the S2 and S4. The rest are ugly. Curved corners. Kumar123, make up ur mind! I swore in earlier comments u said tht the S6 is identical to the iPhone 6..! It's different, I'd say its because of the waterproofing if it is indeed waterproof. The S7 looks like what a Sony made S6 would look like. The Z5,Z4,...ect have this look about them, that screams waterproof and that's the look the S7 has. No, it's the Note 5 design. It no longer has rounded edges with the flat cut running up to the round corners. I also preferred they style of the edges on the S6 to the Note 5. It looks ugly as compared to S6. I am definitely looking forward to LG G5 this year. Lol what?! Haven't seen the G5 leaks? Dam right, ugly POS. The A9 should've been the S7. I was so excited for the S7, or the Edges. But... But I love my Note4, and really hate the Note5. 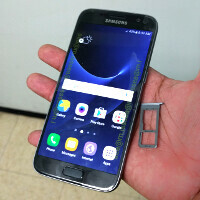 Looks like the ugly S6, S6edge. S6 was a failure and Samsung were sweeping it under the rug. They always do trial and error. if you look closer. the phone still has plastic protective film covering front and back. That's the plastic on the back though. Are that lazy to swipe the phone for 5 seconds.? Well my friend, it's Samsung's SuperPower. They can even make glass looks like plastic. Every Samsung article you will find this relentless troll. Looks more obsessed with Samsung hate than anything. It's true though. They use cheap fake plastic on their Note3, instead of using real leather. Even the side rims were made with plastic, but felt and looked like real metal or steel. I deeply hate plastic. It's a sign of cheap rubbish made quality. When a item has weight to its products, it's well build. That's like saying I had a powerbank by EasyAcc, and it was made all with plastic and rubber. Then when I had the Anker powebank, it was all made with metal, steel, it was heavy. Pure sign if quality. Let's not confuse perceived quality vs actual quality. Aluminum is rubbish on its own. My old MBP surely feels more sturdy but it was riddled with dents.